On arriving at the Male airport, meet representative who helps you with assisted transfer to your resort by speedboat. Complete the check-in formalities at the resort. Thereafter, the day is free to admire the scenic beauty of massive lagoons sprinkled all around. You are free for leisure activities- take a dip in the blue sea waters, explore the nearby attractions, walk on the sandy beaches and so on. Post dinner, overnight stay in Maldives. The second day of the tour is free to enjoy a lazy day around on the white sandy beaches of Maldives. Indulge in the activities of your interest. Treat your eyes to the enchanting beauty spread around you. You can also visit any inhabited island to explore it or simply go on-board a cruise. These cruises range from small sailing boats and go up to ships that have as many as 75 cabins along with world-class services and amenities to boast of. Dinner and overnight stay in Maldives. Day 3 of the tour is completely at leisure where you can do anything that you want to. Start your day with a sumptuous breakfast. You can simply relax on the beach or can partake in water sports like snorkeling, scuba diving, surfing, water polo, explore the underwater coral reefs and marine life. You can also visit Male, Maldives’ capital city. Male is an amazing mix old and new sensibilities. Back to the hotel for dinner. Stay overnight in the Maldives. Post breakfast on day 4, get all set for another interesting day that you can spend as per your own preferences. If you wish, you can opt for a half-day island hopping tour. 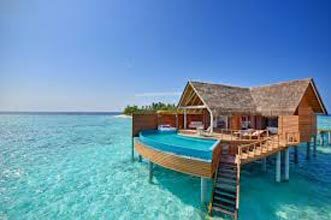 Maldives comprises of around 1200 small islands. Treat your eyes to the beauty of these amazing islands. You can laze around on the popular beaches, have a lot at the lush scenery and prosperous vegetation, take a leisure walk, soak-in the serenity and more. Back to the hotel for dinner and overnight stay.